We should have been able to hold our shoot on the last Sunday in April but our landlords will not permit this so it will be on the Sunday before Easter which is April 14th. Local Area Map, Drop off & Parking Map. Venue: The Old Dunstonian&apos;s Sports Club, St Dunstan&apos;s Lane, Beckenham, Kent, BR3 3SS. Rounds: York, Hereford, Bristols 1 to 5. 4 Archers per target. Awards: Juniors 1st, 2nd, 3rd, Seniors dependent upon entry. Entry Fee: Seniors £12.00, Juniors (under 18) £8.00. Judges: Mark Davis, Tony Harris & Debbie Horn. • UK records and Rose awards need to be claimed through the tournament organiser who will send the claims to Archery GB. County and club records should be claimed through your club records officer. • This Record Status Shoot will be liable for Drug testing and competitors approached to give samples must comply. Any refusal to do so will be treated as a positive result. • All Juniors must have a parent / guardian sign the drugs testing form. 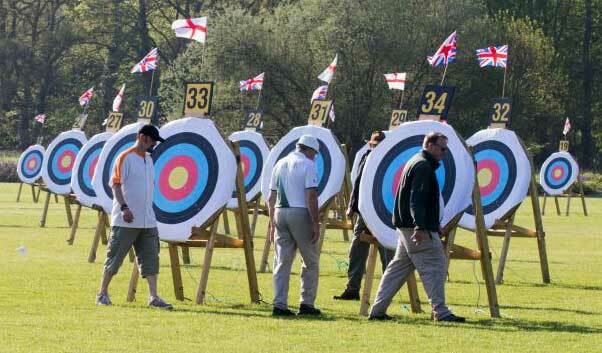 • Archery GB Rules of Shooting (307) Dress Regulations must be adhered to. • Only members of Archery GB or World Archery are permitted to shoot at this tournament, membership cards will be required. • Juniors must have a responsible adult with them at all times. • No all carbon arrows to be used on the field unless they have been made capable of being found with a metal detector. It is your responsibility to find any missing arrow before leaving the rugby field (we will help of course!). • While every effort will be made by CPB we cannot be held responsible for damaged arrows or any loss or other damage while on our field. • Only Guide dogs are allowed on to the range. • Food will be available as usual, probably similar to last year: bacon or burgers in buns. • Tea and coffee by self service (we never get enough volunteers to do everything). • The Archery GB Protection of Children and Vulnerable Adults Policy requires that any person wishing to engage in any type of photography, filming or videoing at the tournament must register their intent with the Tournament Organiser at the start of the event. To make everybody&apos;s life easier we would ask that you enter the range from the small mini roundabout at the junction of Hawksbrook Lane and Wickham Way. Do not attempt to come in from South Eden Park Road unless walking, as there are several steel bollards and a gate in the way! If your satnav takes you that way, your need to turn left out of Hawksbrook Lane and go under the railway bridge. Left at the roundabout and continue along South Eden Park Road into Beckenham Road. Go past the road on the left to West Wickham station and then immediately left at the traffic lights into Red Lodge Road. Through the 7ft width restriction and take a slight left at the mini roundabout still following Red Lodge Road. Go straight over another mini roundabout at the start of Wickham Way and immediately left into the correct end of Hawksbrook Lane. Drive down Hawksbrook Lane and follow along to the right into St. Dunstan&apos;s Lane. Turn sharp right and the car parks are on the right hand side. The first one is for drop off, disabled archers and officials only. The second car park on the right and the third are all ours and can be used but please park tidily. There is a path from the third car park on to the range.